I was looking for a different rear tire to try on my WRR. Something that is a bit more aggressive but will wear fairly well. I have ran the rear D606 before and so far that seems to work the best for me in terms of aggressiveness and tire life. However, I have read some good things about the Motoz Enduro IT rear tire and then I also have read some not so good things. 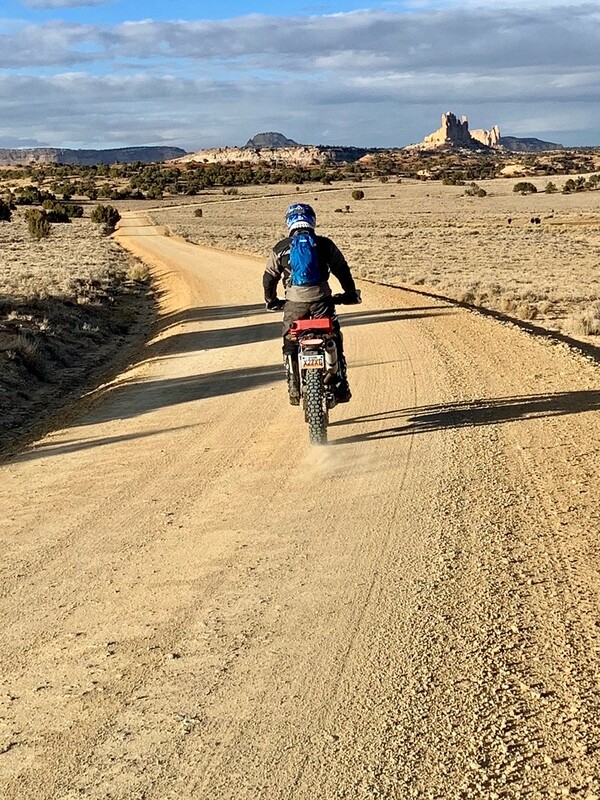 One of the user comments on RMATV is that the tire does not do well in muddy loose single track but your pictures would seem to indicate that it does a pretty decent job. So how does it perform in muddy loose single track and what sort of mileage are you getting out of them? I'm currently at about 3300 kilometers (2000 miles +/-) and have 40% tread remaining. My riding is 75% off pavement, 25% on. Dirtleg, ACR, mk23 and 1 other person like this. For those of you that have lowered the rear with just the stock shock clevis adjustment, did you also lower the front by raising the forks or just keep it stock? Has anyone here played with the front height to see how it changes the handling of the bike? I am thinking about lowering the rear with the stock clevis and wondering what I should do for the front. I have not done this to my WRR but I rode a friend's WRR who maxed out the rear but kept the forks in the stock position. The bike changed directions pretty quick with that setup but it also was prone to head shaking on the highway at highway speeds. Depending on how much you drop the rear my guess would be the bike would be less prone to headshake at HW speeds but may tend to push the front in the turns. Best thing to do is first set your sag and then I would drop the rear and ride the bike to see what you think. If you want to increase how fast it turns then raise the forks in the triples a little bit. Don't be afraid to play around with it until you find something you like. Sometimes a rear tire can make the difference, some is way bigger in diameter, and weighs a ton, this would alter the gearing significant. I've had tires so different that I needed to change the front sprocket to get back close to the ratio before the new tire. Thanks, but none of that. I ran smaller tires on the 08 - air filters not dirty on either. I'm thinking BluePill nailed it. The two engines have obvious performance differences without mods. When I picked up my 2008 new, the dealer had pushed up the front forks and left the rear at stock height. Talk about unstable and skitterish! My first adjustment was to lower the rear to the maximum. Handling was way better, but unstable in cross winds at Interstate speeds. Then I reset the forks to level at the triple clamp, and the highway manners got better. That is what I now have both of my WR's set at. If I were to be doing extended slow single track with no highway, I would push the fork tubes back up for faster steering. As already said, both adjustments are fast and easy, so trying the different combos are the way to go. I finally edited some video from July, this is day 1 of 4 on the PA section of the MABDR. Pittsburgh to Maryland. The is what the WR250R is all about! DirtDad, speedtrials, FLICKIT and 5 others like this. Did a little roaming in the Swell last weekend. eemsreno, max384, eddyturn and 8 others like this. With my setout it is stable at speed but still turns in mint, as these wee girls are tight on the geometry they are nimble anyway, on reading what a lot have done here is lower the rear a little more than the front which does help reducing head shake. If you want any measures or pics lemme know and I will swing up some info. I just changed the oil & filter on my new to me 2016 WR250r. Well I am somewhat embarrassed and ashamed to say I didn’t notice the Moose skid plate on the bike was plastic. I intend on replacing it with the Moose aluminum plate unless you folks have a better suggestion. I don’t feel comfortable with the plastic one but it will do for a few more rides. I bought the plastic one from Moose. I like the way it fits. It slides over rocks better than aluminum. I have not noticed any increased noise. Keep what you have and spend the money on other goodies. mf13368, wwguy, Bugchewer and 1 other person like this. Also a mounted a plastic moose skid plate, it’s taken some good hits and have yet to puncture it. My friend put a hole in his moose, but he was also fully loaded and landed on a rock shaped like a pyramid. No damage to the bike, although we both thought there would be carnage to the frame. Proud Highway and wwguy like this. Never thought about machining 5mm off the clevis. That is a good idea if the part is still structurally sound. I am going to lower it in the back with the stock adjustment and then play with the front some and see how I like it. Probably should get a seat concepts low seat too. Just a failed master link, nothing serious. Bitingdog and FLICKIT like this. 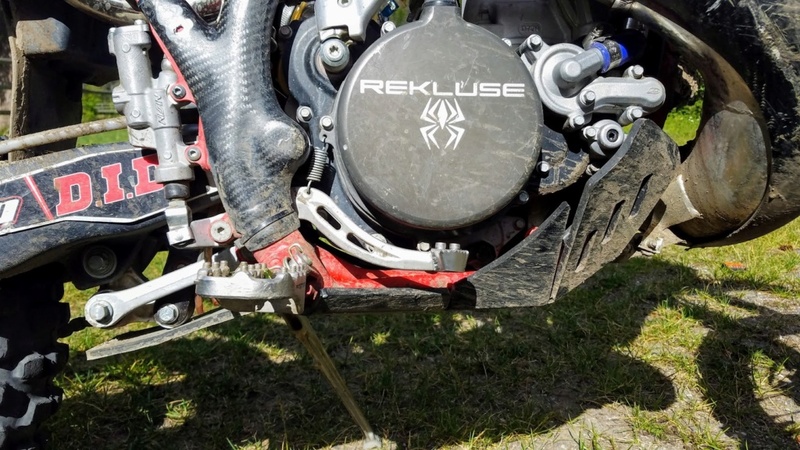 The plastic Moose skid plates are made by AXP Racing in France, who also sells their own version for the WRR. Sure, they get some scratches in them when dragging over rocks, but in general they're bomber-tough and provide great protection from both bashing impact and skidding abrasion. 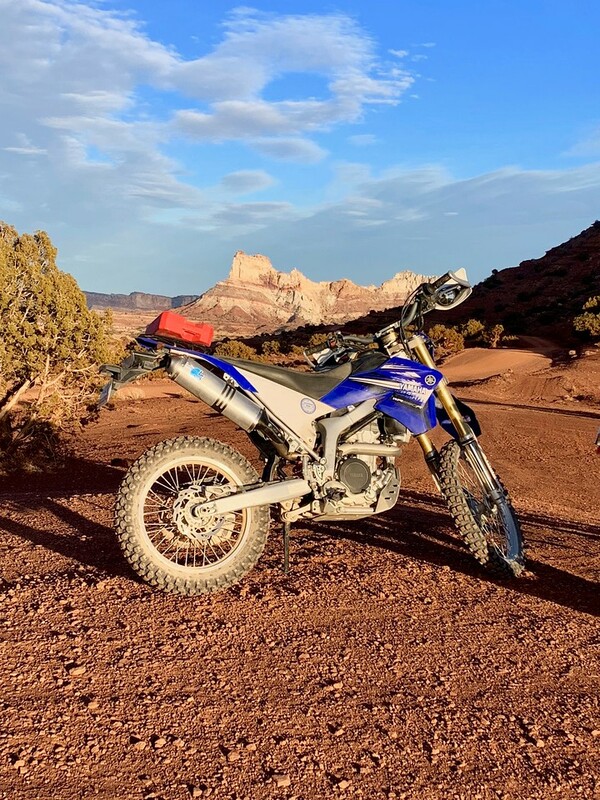 I've run an AXP 8mm plastic skidplate on my Beta 300 two-stroke for 1200+ miles of rocky Idaho mountain and high desert singletrack this year and haven't been at all nice to it. After destroying a carbon fiber skid plate last year I've been amazed at how durable the plastic plate is. TM Designworks makes a similar product for MX and enduro bikes that also gets rave reviews from riders. Unfortunately, despite several attempts, I haven't been able to convince TMD to build one for the WRR. 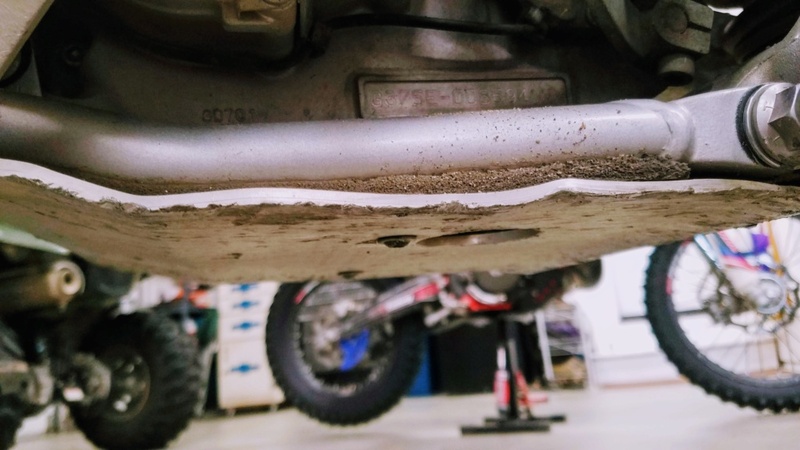 I've been running a Flatlands aluminum skidplate on my WRR for several years and have had a love/hate relationship with it from the start. I love the protection but hate the noise it creates or amplifies from the engine while riding. Like many others I've wasted way too many hours tinkering with foam and sound deadening materials to reduce the noise. But everything is still a workaround and my bike has always sounded better without it. 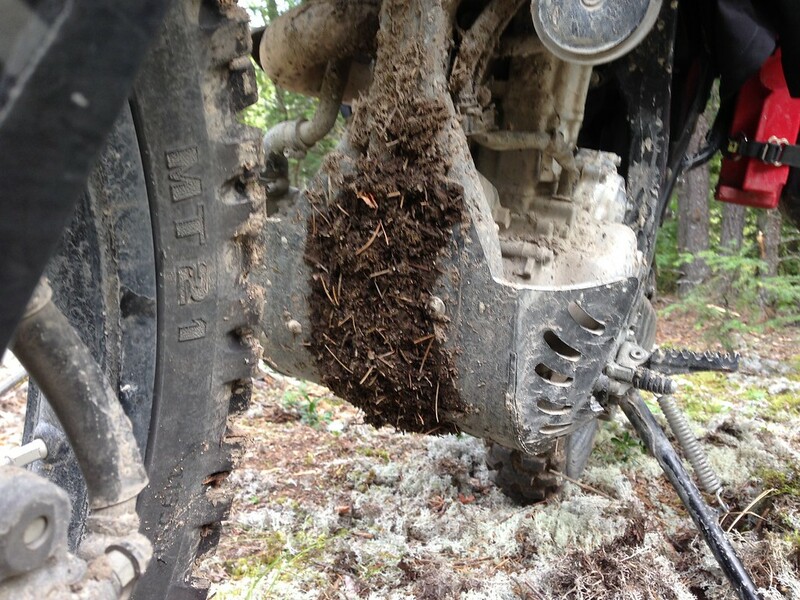 If I had it to do over again (and I may just do that) I'd go with the Moose or AXP skidplate on my WRR in a heartbeat. programradio, woofer2609, Two Moto Kiwis and 6 others like this. NJDualsporter, programradio, eemsreno and 11 others like this. I'm happy with the 6mm AXP bashplate on the wrr. I saw a friend 701 with the AXP 8mm (that also covers the linkage) and it looks really really strong and protective, i see why @wwguy likes it on the beta. woofer2609 and wwguy like this. Heya Janus9, yeah it is an easy job to do the clevis in a mill, somewhere on here an inmate did it thus I did the same, 5mm off the clevis will give you 10mm at the wheel. I took 40mm out of my seat as well, put a 10mm soft top back in it so a 30mm lowering overall in the seat, works very well. 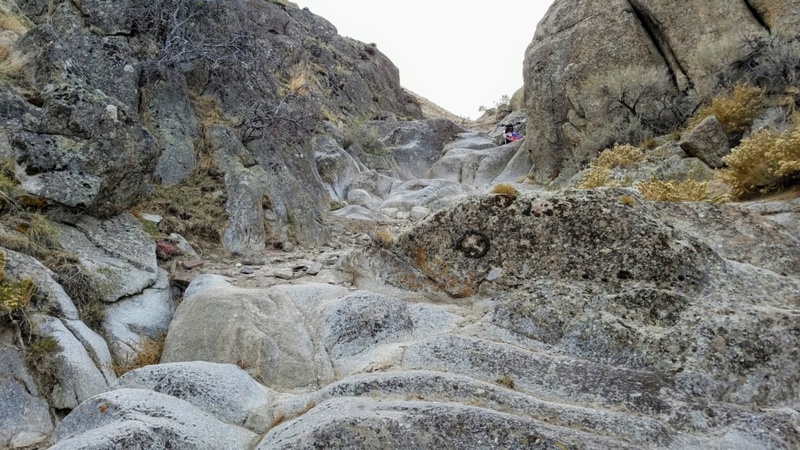 Pictures like this remind me to get down there one day, you know, to confirm how incredibly boring the terrain and roads are said to be. Looks like a trail on the other side of the valley, does it keep going into those distant hills? What trails were you riding? What are some good intermediate trails that you make into a loop? I need to get to Squamish more for dirtbiking, but all my friends in Vancouver mountainbike, so 99% of the time I'm pedalling, which is fine with me. I just explored the Disneyland trials motorcycle trail up behind Brittania Beach. Extremely technical riding that is an uptrack for trials bikes, downtrack for mountainbikes. NJDualsporter, ACR, greenboy 667 and 6 others like this.